Hot flushes and night sweats are distressing symptoms of the menopausal transition and affect 75% of women in the Western world. Unsurprisingly many women seek medical treatment because the severity of their symptoms affects the quality of their day-to-day life. The symptoms experienced by women who suffer from hot flushes generally include a sudden feeling of heat in the face, neck and chest accompanied by redness and perspiration. When hot flushes occur at night they are referred to as night sweats. While some women go through the menopausal transition without experiencing hot flushes, many women report waking up in the night completely drenched in sweat, to the degree that they might have to change bed linen and nightwear, or even shower. We always take an evidence-based approach orientated towards the Personalised Health approach and aim to provide you with actionable knowledge and tips to help you on your journey to optimal health. Let’s look into what causes hot flushes and night sweats and take an overview of what conventional treatments are available as well as natural treatment options. The mechanisms underlying hot flushes and night sweats are poorly understood, although it is generally assumed that they are due to disturbances of the hypothalamus (the thermoregulatory centre in the brain), believed to be caused by oestrogen withdrawal. It is more likely to be erratic fluctuations in hormone levels that cause disturbances within the temperature control area of the brain, rather than a simple drop. Although hot flushes frequently accompany the oestrogen withdrawal that occurs at menopause, it is not thought that oestrogen is solely responsible as levels do not differ between women with symptoms and women with none at all. Your GP is likely to offer HRT (hormone replacement therapy) for the main symptoms of menopause such as hot flushes and night sweats. Studies show that oestrogen virtually eliminates hot flushes, however its mechanism of action is not known. Despite oestrogen therapy being the standard treatment for typical menopausal symptoms, reports highlighting adverse effects, such as breast cancer, cardiovascular disease and strokes have raised concerns and anxiety amongst both patients and practitioners. 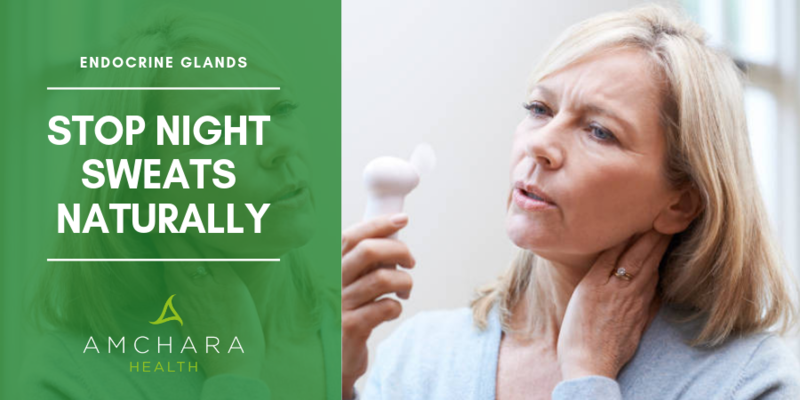 According to Dr Marilyn Glenville PhD, the UK’s leading nutritionist specialising in women’s health, countless women are put on HRT for hormone problems only to find they were not menopausal at all. Doctors may also recommend other medications, such as some types of antidepressants and blood pressure lowering drugs, which can reduce hot flushes, however these are associated with a number of possible side effects such as dizziness, headaches, constipation, nausea and dry mouth. What can you do naturally to reduce symptoms like hot flushes and night sweats? The risk of side effects from conventional treatments can be very off-putting, so many women prefer to try a natural approach. Most non-hormonal therapies such as vitamins, minerals and herbs take longer to act than oestrogen treatment and therefore need to be taken for at least 3 to 6 months to determine the benefits. There is an enormous range of natural therapies available to treat hot flushes and night sweats which can make it difficult to choose. To make it easier for you we’ve focussed on nutritional options and narrowed these down to 7 of our favourite tried and tested remedies. A diet to help control blood sugar levels can be of great benefit as drops in blood sugar can trigger hot flushes. Researchers have found that hot flushes can be experienced when blood glucose falls between meals. Furthermore, the frequency of hot flushes has been seen to increase as time between meals increased. Simple dietary changes can help to keep blood sugar levels balanced throughout the day. Focus on small, frequent meals that include slow-releasing carbohydrates, balanced with a serving of protein or healthy fats (i.e. avocado, flaxseed oil or olive oil). Include whole grains like organic gluten free oats and brown rice, as well as vegetables and fruits and add some good quality protein e.g. fish, lean meat, beans, poultry, tofu, eggs, nuts and seeds. Avoid sugar and stimulants like alcohol and caffeinated drinks. The more sugar you eat, the greater the insulin production, which will enhance fat deposition and oestrogen storage and production. As well as maintaining a well-balanced diet, which will provide the variety of nutrients needed to enable the body to adjust automatically to hormonal changes, foods rich in phytoestrogens can also bring significant relief from hot flushes and night sweats. Phytoestrogens are plant substances that produce oestrogenic effects. There are a number of plant foods containing phytoestrogens that have traditionally been used at the menopause. The main ones are termed ‘adaptogens’, which have a hormone balancing effect on the body. They are thought to gently interact with human oestrogen receptors on the cells, helping to modify the effects of insufficient or excess oestrogen in the body. There are 3 main classes of phytoestrogens: isoflavones, lignans and coumestans. These can be found in a range of plants including hops, dandelion, flaxseeds, red clover, sage, soy (GM free and fermented is best) and alfalfa. The key therapeutic components in soy are isoflavones, which are only metabolised into their active form by the gut flora. Regular consumption of fermented foods such as tofu, tempeh, kefir and sauerkraut can help to feed beneficial bacteria in the gut. An Italian study, published in the Journal of Obstetrics and Gynaecology, suggests that soya isoflavones can reduce the frequency of hot flushes by as much as 45%. In Asian cultures where soy foods are regularly consumed, menopausal discomfort is virtually unheard of. Asian women are also significantly less prone to breast cancer. Even though a wealth of research has identified that soy reduces the risk of breast cancer, there are still concerns amongst some women and health practitioners that because soy foods contain isoflavones, they may increase the likelihood of developing breast cancer, or worsening the prognosis of those who already have a diagnosis. However according to data from an abundance of clinical and epidemiological papers, these concerns are unfounded. Clinical trials consistently show that isoflavones do not affect breast tissue density and cell proliferation. What’s more, studies across 11,000 women from China and the USA, supports the safety of soy foods for women with breast cancer. Results show that post diagnosis, soy foods significantly reduce the recurrence of breast cancer and improve survival. Bioflavonoids are active compounds found in plant foods and have a range of biological activity. They are known for their antioxidant and anti-inflammatory properties but have also been shown to bind to oestrogen receptor sites, helping to normalise oestrogen activity in the body. Bioflavonoids are often associated with vitamin C because this combination is often found in foods, particularly citrus fruits. According to research, administering vitamin C with bioflavonoids to menopausal women reduces hot flushes. Vitex Agnus Castus (the chaste tree) is another popular herb that has been found to be beneficial for alleviating hot flushes. Rather than acting as a direct phytoestrogen, Agnus Castus appears to work to restore balance by stimulating and normalising the function of the pituitary gland, which controls and balances hormones throughout the body. Agnus Castus is also considered an adaptogen, helping to increase certain hormones if they are too low and reduce levels if they are too high. It may bring stability, which can help to alleviate hot flushes and night sweats. Recommended doses of between 120-480mg/d have been shown to reduce symptoms. When you’re aiming to balance female hormones it is important to add in herbs that can support liver function. Keeping your hormones in balance relies on having effective systems in place to clean up and excrete old or excessive hormones. The liver plays a significant role in maintaining hormone balance because it helps to process, regulate and direct various hormones to carry out functions around your body. It also works hard to detoxify your hormones once their work is done so that they can be safely eliminated via the urine and faeces. Milk thistle has been used for centuries as a remedy for liver problems and has been studied extensively. According to research, silybum marianum has liver protectant actions, which promote liver regeneration, and has been found to alter outer liver cell membranes that block the entrance of toxins. Clinical data suggests that 420mg/d of milk thistle standardised to 70-80% silymarin is considered safe to be taken for up to 41 months. This is often the herb of choice for women suffering from menopausal hot flushes and night sweats and there have been a number of good clinical trials that confirm its effectiveness. Black Cohosh appears to work as a selective oestrogen receptor (SERM). This means it can have oestrogenic effects in some organs but none or even anti-oestrogenic effects in other organs. Black Cohosh seems to lack an oestrogenic or stimulatory effect on tissues in the uterus and breast, which is important in terms of oestrogen dominant conditions such as breast cancer. However it does have a beneficial effect on the parts of the brain that control hormone balance, which may explain its ability to alleviate hot flushes and night sweats. Several studies have concluded that black cohosh is non-toxic, non-carcinogenic and suitable for long term treatment. In Europe, where it has been used successfully for over 40 years, the results from over 1.5 million cases demonstrate excellent tolerability and minimal adverse effects. The current recommended dose is 40-80 mg per day, and at least 1-3 months of treatment may be required before therapeutic benefits become apparent. Supplementation with vitamin E has been reported to help relieve typical menopausal symptoms such as hot flushes. It seems that women with low vitamin E status appear to suffer significantly more hot flushes. Research carried out in the late 1940’s identified that a daily dose of 50-400 IUs effectively reduced hot flushes compared to placebo. In a clinical setting both conventional and alternative health practitioners have observed that a daily intake of 400-1,200 IU has therapeutic benefits. Amchara offer a number of comprehensive tests that are extremely useful and well worth considering if you are experiencing signs and symptoms of the menopause. Did you find this article useful? Have you experienced hot flushes or night sweats? How did you manage? We’d love to hear your tips, get in touch!